Sometimes fate has a very poor sense of humor. It's now Saturday afternoon, and I just realized I lost my previous write up to this post. The horror, the horror! How could such a misfortune befall my workflow? But then in retrospect, perhaps it was for the best. If I were to be perfectly frank, I was somewhat unsatisfied with what I had written. It was getting too narrative to the point of irrelevance. At the very least, I should try to be more informative. After all, this blog post will attempt to do something that hasn't been demonstrated before on the internet (or at least to my knowledge). I will demonstrate how the Leica 21mm f/4 Super Angulon-M can be used on a Leica M10. For those of you who are not familiar with this lens, it is probably one of the best lens ever made for Leica M-mount rangefinders. Unfortunately, the 21 Super Angulon suffers from issues of compatibility when used on a digital rangefinder. The issue of compatibility is caused by the lens design of the 21 Super Angulon. In making it a compact lens, much of the lens had to be recessed behind the lens mount. In doing so, light enters the lens into the camera in a way unintended for conventional digital photography. As a result, the normal operation of the Leica M10 is noticeably impacted, which is why the 21 Super Angulon isn't more popular. Admittedly, the 21 Super Angulon might expect too much from the uninitiated. For one thing, the issue of lens design makes the prospect of conventional metering impossible. To be specific, the barrel of the lens extends beyond the placement of the internal light meter. Because of that, light is obstructed from entering the internal meter for an accurate reading. As a result, the 21 Super Angulon might be a little too challenging for those unfamiliar with external meters or the Sunny 16 Rule. Sunny 16 Rule aside, there are still bigger issues than metering that makes the 21 Super Angulon much too problematic for even the initiated to handle. Because of how deeply recessed the 21 Super Angulon is, the distance travelled by the incident light from the rear element to the sensor plane is much too short for optimal digital capture. As a result, an unmistakably magenta color shift appears on the right hand side of the documentation. Speaking anecdotally, this magenta color shift is likely the reason why the 21 Super Angulon isn't more popular in digital image capture. Dealing with such an aberration in documentation might be too much for even the most initiated of professionals to accept (much less enthusiasts still finding their way). It's no wonder then the 21 Super Angulon is largely ignored on online reviews, unless if the image captures are converted to black and white. That said, I've often wondered if the color shift from the 21 Super Angulon could be resolved in post. If so, this lens rightly deserves a second look. After all, there are many useful advantages specifically offered by this lens. It is the only 21mm M-mount lens with a 39mm filter thread. In addition, it can almost focus as close as 15" (or 0.4m). But most importantly, what's best about the 21 Super Angulon is it's size. It's just so compact! Yes, size is the defining feature of the 21 Super Angulon. It is the reason why I haven't forsaken it. Back in the days of film, I cannot tell you how often such a little gem proved indispensable on those occasions when a wider angle of view became necessary. It's one of those lenses that is small enough to be left unobtrusively inside a bag, only to be felt on those emergency situations when the go-to 28 to 35mm focal length just isn't wide enough. In that way, dealing with color shifts might not seem overly burdensome or even unreasonable in practice, given the benefit of having the 21mm focal length available at the ready. Even so, my aspiration for the 21 Super Angulon extends beyond just emergency use. For that reason, I've decided to compare it to another favorite lens of mine, the current version Leica 21mm f/3.4 Super Elmar-M ASPH. Only in normal use can the 21 Super Angulon be properly assessed. Aside from the aforementioned color shift (which I've already resolved and will explain a little later in this post), what's immediately noticeable about the 21 Super Angulon is how much lower in contrast it appears to render at maximum aperture, when compared to the 21 Super Elmar. This gives the 21 Super Angulon a softer look, which on first impression could be mistaken for less perceived sharpness. That said, perceived sharpness is not an actual indication of resolved detail. In my opinion, the 21 Super Angulon is relatively sharp, especially considering it is a lens released sixty years ago. And upon closer inspection, especially at high magnification, it does appear to resolve detail sufficiently. However, what is notable is the difference in corner sharpness between the 21 Super Angulon and the current version 21 Super Elmar. At higher aperture, the 21 Super Angulon is significantly softer than the 21 Super Elmar. However, the lack of perceived sharpness can be resolved rather easily in post by an increase in contrast and color saturation. Furthermore, when stopped down, corner sharpness noticeably improves on the 21 Super Angulon. Case in point is the title image of this post. Photographed stopped down and optimized in post, the final image appears to be as perceptibly sharp, from corner to corner, as the 21 Super Elmar. Also worth noting about the 21 Super Angulon is how well it deals with distortion. In comparing sample images with the 21 Super Elmar, I believe the 21 Super Angulon exhibits an incremental if not negligible uptick in distortion, compared to the 21 Super Elmar. In my opinion, I find the lines of perspective captured by either lens to be relatively straight, with any hint of linear warping to appear similar between the two lenses. In addition, the 21 Super Angulon also exhibit slightly more vignetting than the 21 Super Elmar at higher apertures. However, when stopped down to around f/8, vignetting improves, but continues to be noticeably more visible than on the 21 Super Elmar. That said, I've never had an issue with vignetting, since I've always found it naturally reinforced subject isolation with the aesthetics of days gone pass. One aberration I do find rather curious about the 21 Super Angulon are incidents of what I believe to be hotspots or flares at the center of the captured image. If you look at the samples provided, the abnormality appears as a sudden increase of reduced contrast. At first, I thought my eyes were deceiving me. But then, I noticed the hotspot generally went away when the image captures are slightly underexposed. That said, vignetting also increases with the change in exposure. Leica M3 + Leica 21mm f/4 Super Angulon + Kodak Portra 800 - ISO 800, 1/500s, f/5.6 - seems like my Pakon F135 film scanner is a little off here. Leica M3 + Leica 21mm f/4 Super Angulon + Kodak Portra 800 - ISO 800, 1/125s, f/5.6 - seems like my Pakon F135 film scanner is more than a little off here. Despite falling short of the 21 Super Elmar, I believe the 21 Super Angulon is a remarkably well performing lens. In my opinion, the 21 Super Angulon appears to offer performance close to the 21 Super Elmar, but in a much more pocketable design. Still, the 21 Super Angulon has issue of compatibility with the Leica M10. And it would only make practical sense to consider it if those issues can be resolved without significant involvement. With regards to the metering issue caused by the recessed lens design, the Leica M10 does have another trick up its sleeve. Metering can also be visually approximated through live view or an electronic viewfinder. That said, the live view user experience might not seem ideal, given the lag time in recocking the shutter. However, relying on it might not be the worse solution. 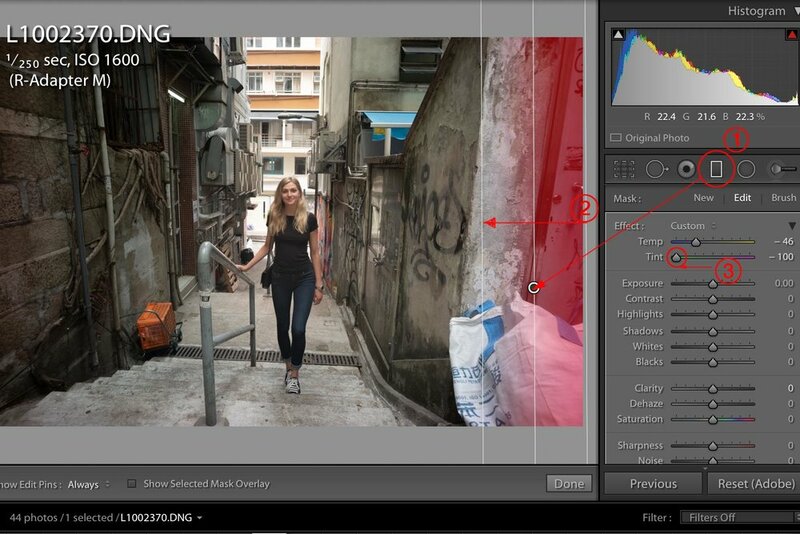 In addition to resolving the issue of metering, it also enables the 21mm angle of view for more better framing. Of course, the larger issue of compatibility isn't metering. Rather, it's the magenta color shift. Thankfully, the solution is actually quite simple. In Lightroom, it's simply a matter of using the gradient tool, where it is applied to only the affected region on the documentation. After that, it's just a matter of adjusting the tint away from magenta until the color balance of the affected region is similar to the rest of the image. Please refer to the example at the end of this post. Admittedly, it's reassuring to know these issues of compatibility can be resolved in digital capture. Still, I believe the 21 Super Angulon is best on film. Even though it appears to lag behind the 21 Super Elmar in overall observable performance and rendering, it does appear to render better on film than on digital capture. In my opinion, there is a noticeable increase in relative contrast and resulting perceived sharpness. Having said that, the 21 Super Angulon also cannot meter on an analog M-mount rangefinder. Admittedly, this is not really a significant concern. But for those uninitiated who are unfamiliar with either an external meter or the Sunny 16 Rule, that oversight might present a material challenge. As such, shooting live view on the Leica M10 might make more sense for recreational photo enthusiasts than film capture. However, there is something to be said about using a lens the way it's intended to be used. The 21 Super Angulon was designed specifically for film capture (or rather designed during a time when film was the only choice). Still, knowing that the 21 Super Angulon can be used on the Leica M10 for color digital capture is reassuring. But I suppose it's just a matter of whether one is willing to undergo the process of additional effort in post. Finally, a word on the 21 Super Angulon with different full frame digital cameras. On the the Leica M9, the 21 Super Angulon will experience the same issue of compatibility. The metering will not work, and color shift will be just as noticeable. However, I didn't test it specifically on the M9 for this review. As such, I cannot comment further beyond an anecdotal account. Having said that, it shouldn't be significantly different from image captures from the Leica M10. On the Leica M240, the availability of live view compensates for compatibility issues in metering resulting from the lens design. With regards to the issue of color shift, the M240 appears to be the same as the Leica M10. That said, I didn't test the 21 Super Angulon specifically on the M240 for this review. However, it is likely that the methodology in resolving the color shift is the same as on the Leica M10. With regards to adapting, the 21 Super Angulon won't fit the Leica SL. The rear element of the lens is much too wide and deep, and will encounter blockage that will prevent it from being mounted securely onto the camera. As for Sony FE mount cameras, the 21 Super Angulon adapts without issue. However, the metal barrel of the rear element will leave a rub mark against the camera at infinity focus. That said, the lens does not appear to exhibit any signs of color shift. Having said that, I am not particularly impressed by the rendering on the Sony A9. In my opinion, Sony sensors seem to require lenses with higher contrast, which isn't the case with the 21 Super Angulon. Like I said, this lens is made for film capture. Nevertheless, it's really not too bad on the Leica M10. Exposure of some photos may have been tweaked in Lightroom, for the sake of consistency in presentation. Only the title image have been cropped and fully optimized in Lightroom. Also worth noting, the title image was also edited in Photoshop to remove an unfortunate photobomb in the background. Last, all images taken by the Leica M10 and the 21mm f/4 Angulon were edited further to remove the color shift on the right hand side of the image. The methodology of removal is demonstrated in the final image set below.